Purpose: Changing the spark plugs and wires are vital to keeping your car running at its best. The factory claims that you don't have to change your spark plugs for 100,000 miles. If that isn't the biggest load of crap, I don't know what is. After a few good hard runs at wide-open throttle (WOT), you won't have any platinum left on your plug. Your wires are not all that good either, that is why we are replacing them with a very good set. Preface: Be sure you are performing this plug and wire swap on a cool car (cool temperature wise). Your arms are going to look like they have been drug over freshly paved asphalt at 50 mph when this is over. If this is your first time doing this to a LS1 Camaro, you might want to allow a full 8 hours just in case. It took us 5 hours to complete this install. You don't have to do all 8 plugs at once. We took two (2) days to complete our installation. We even drove the car with new plugs and wires on the driver's side while the passenger side remained stock. We believe that after you read over this install, you should be able to perform the change in under two (2) and a half hours your first time. 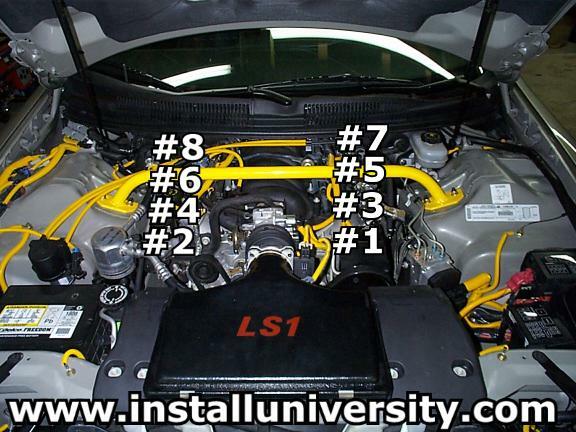 This should get easier each time you do it and your install time will decrease dramatically over time. We highly recommend removing the shock tower brace if your car has one. 1. Let's go ahead and number the cylinders according to General Motor's specifications. See Figure 1 to get familiar with the cylinder numbering. We are going to refer to the spark plugs and wires, by the cylinder number. 2. We opened the hood of the car and proceeded to change the driver's side spark plugs and wires first. This way we would feel good and not get discouraged very early during the install. Locate your spark plugs and wires on the driver's side of the engine (plugs & wires 1,3,5, and 7) (see blue arrows in Figure 2). 3. 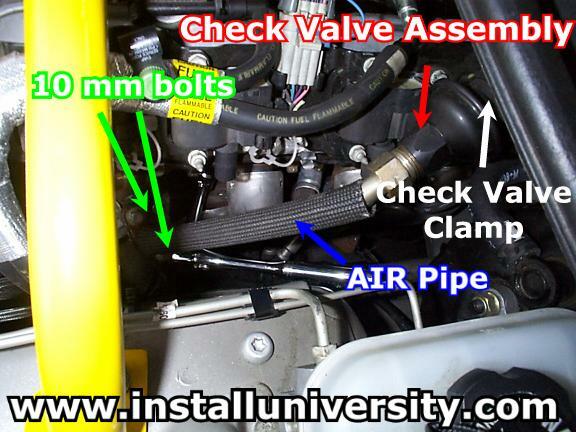 Notice the AIR pipe (metal pipe: will have a protective cover on it) connected to the exhaust manifold; (see blue arrow in Figure 3), and check valve assembly (bell shaped object connected to the AIR pipe) (see red arrow in Figure 3). It is not necessary that you disconnect this; we did not disconnect this during our install. However, you can bet we will disconnect it the next time we do a plug change. We could have saved ourselves a bunch of time, not to mention skin on our arms, with that line out of the way. There are two ways you can go about this on the driver's side. Notice we said the driver's side. We recommend the first method (Method A) on the passenger side. Note: Read part A and B fully before proceeding any further. A. The first way is to completely remove it. 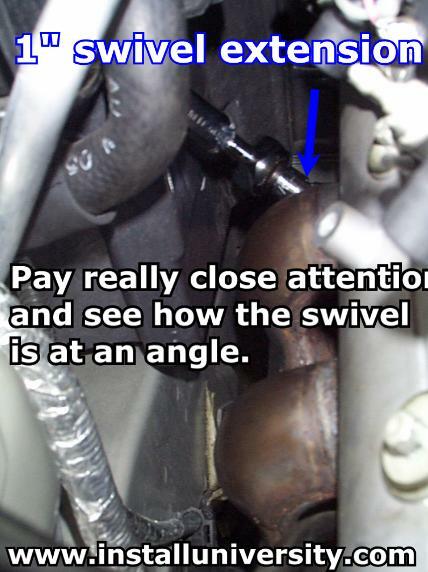 To disconnect simply remove the AIR pipe from the exhaust manifold using a 10 mm socket/ratchet (see green arrows in Figure 3). There is a metal gasket in between the AIR pipe and exhaust manifold. Be very careful not to damage this gasket. If it is broken or missing a piece you will get a loud ticking sound when the engine is under load. The part number for a replacement gasket is 12553617. Then you will want to remove the check valve clamp from the opposite end on the far side of the check valve assembly (see white arrow in Figure 3). You can remove the check valve clamp by using a fingernail (or flat-head screwdriver) and lifting ever so gently and spreading it apart. Then you can leave the plastic clamp on the rubber hose or remove it and set it aside. B. The second way is to just remove the two (2) 10 mm bolts and lay the assembly up on the intake. This saves you a little time. We recommend using the first method (Method A) on the passenger's side. 4. With that out of the way go ahead and take off the spark plug wires. You should just pull the wire off each coil pack (see blue arrow in Figure 4) and then pull them off each spark plug. It will be a little harder to pull them off the spark plugs because they also have a metal heat shield (just yank on them). 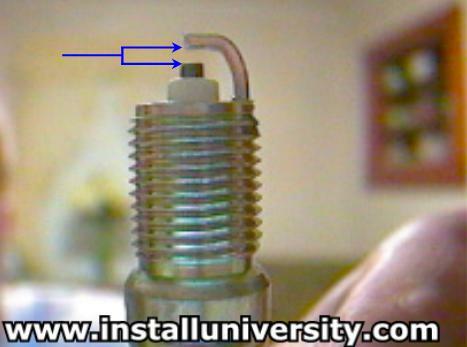 Take a look at the factory spark plug wire (see upper right hand corner in the Figure 4). 5. Grab a spark plug 15 mm socket, a three (3) inch extension and a ratchet. 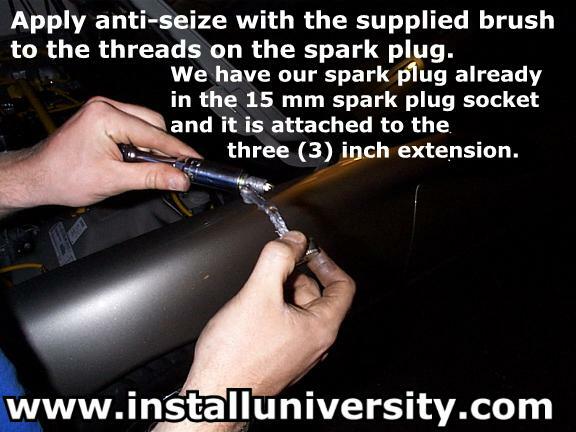 Simply connect the extension into the socket and slide the socket over the spark plug. 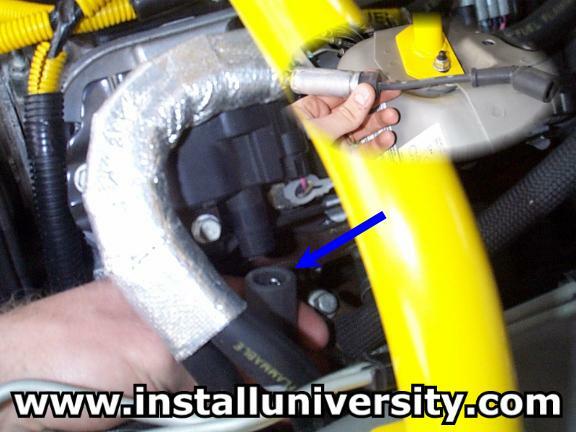 Then you can attach your socket to the extension and you are ready to try to break your spark plug loose. This might be difficult or even seem impossible. You might get really mad, bash your fingers, or worse. So be patient and understand that you might have a problem. Don't give up is the best advice I can give. Also, understand that you should direct the force on the ratchet so that it is focused around the center of the plug. 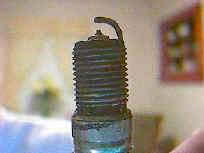 You don't want to be pulling on the ratchet so that it places stress on the ceramic spark plug. That could possibly break a plug and just use common sense and a lot of muscle. 6. 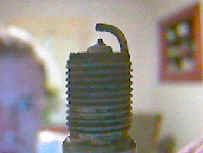 Now you are ready to get a new spark plug ready for installation. You need to look over the plug for any noticeable defects. Then you should check the gap on the plug. The gap is the distance between the firing tip and the electrode (see Figure 5). You need to get a "Plug Gapping Tool" from the local auto parts store. You should check the gap and make sure it is correct. The factory gap is 0.060 inches. We gapped our plugs at 0.059 inches, which is also the same gap that is shipped with our NGK TR55 plugs from the factory. 7. Now that you have successfully pulled your first plug, go ahead and get a new plug ready for installation. 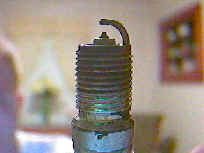 We place anti-seize on our spark plug threads (see Figure 6). This makes it easier to pull next time we change our plugs. This also makes it easier to thread in and that is not necessarily a good thing. 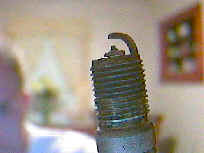 Be very careful not to cross thread the plug into the spark plug hole or thread in the spark plugs too far. You should torque the spark plug to 11 ft-lb. 11 ft-lb is not a lot of torque and you should try to use a torque wrench if at all possible. You don't want to tighten them very tight. In fact, we just tighten our plugs to "snug" (maybe a 1/4 turn past finger tight) because we find it hard to use a torque wrench during this install. We don't want to damage the plugs, engine, or have to fight them to get them back out next time. 8. Go ahead and repeat the procedure for the other three (3) plugs on the driver's side of the engine. You should only need a ratchet, three (3) inch extension, and 15 mm spark plug socket to finish that side. 9. 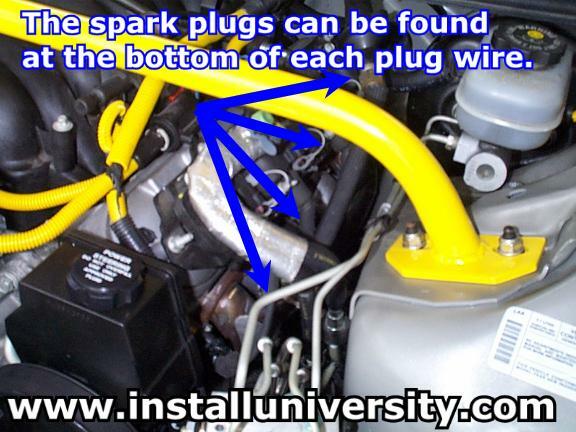 Now that you have completed changing your spark plugs you are ready to install your new wires (or the same ones). Just put them back on the same way you took them off. 10. Now you need to reconnect your AIR pipe. Torque the two 10 mm bolts to 15 ft-lb. You are now done with the driver's side; get ready for the passenger's side! 11. Now locate the plugs and wires on the passenger's side (plugs & wires 2,4,6, and 8). We removed a lot of stuff to change the plugs on this side of the engine. We figured out that we could remove two things and solve our problem. Go ahead and remove the AIR pipe just like you did on the driver's side. You can use either method, remove completely or move up to the side. We recommend removing the AIR pipe completely for this side. Note: Read the next paragraph before proceeding any further. 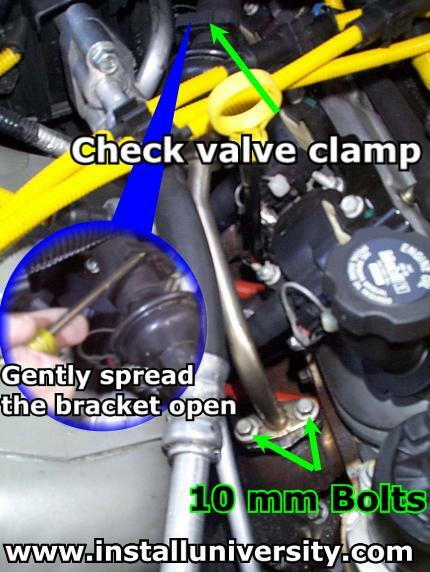 To disconnect simply remove the AIR pipe from the exhaust manifold using a 10 mm socket/ratchet (see green arrows in Figure 7). There is a metal gasket in between the AIR pipe and exhaust manifold. Be very careful not to damage this gasket. If it is broken or missing a piece you will get a loud ticking sound when the engine is under load. The part number for a replacement gasket is 12553617. Then you will want to remove the check valve clamp from the opposite end on the far side of the check valve assembly (see Figure 7). You can remove the check valve clamp by using a fingernail (or flat-head screwdriver) and lifting ever so gently and spreading it apart. Then you can leave the plastic clamp on the rubber hose or remove it and set it aside. (Alternatively, you can swivel the entire assembly up onto the air intake only having to disconnect the pipe from the exhaust manifold). 12. 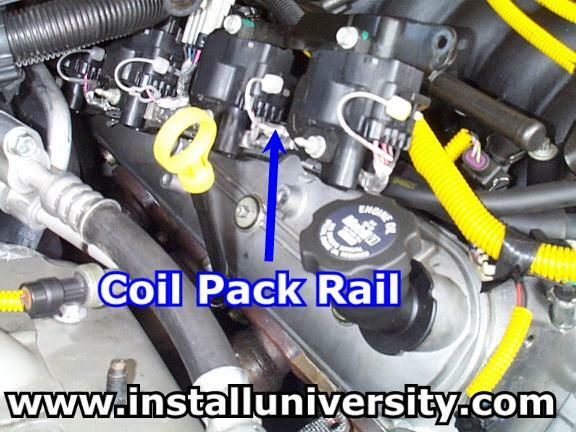 Now, you want to move the coil pack rail. There are two ways to go about this. We highly recommend the first method (Method A). A. We suggest removing all the bolts from the coil packs except the far back one. (1998 F-Body LS1 vehicles have individual coil packs. You can just take off individual ones instead of the rail.) We recommend just loosening it up enough to move the coil pack up a few inches to get it out of the way. The 1998 F-Body cars will not have a coil pack rail. They will be individually bolted on and you should be able to remove them in the same manner. 1999 and 2000 model F-Body cars will have the rails. 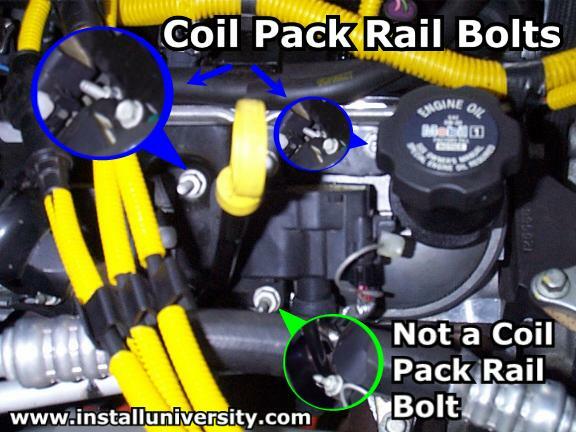 Locate the bolts on the coil pack rail (see blue arrows in Figure 8). We have tried to show you the difference in the bolts on the rail in Figure 8. The bolts that have a flat top are the ones you want to remove. The bolts that have a curved top you do not want to remove. You can also tell the flat-headed (for lack of a better terminology) bolt from the curved-headed bolt by looking at the backside of the rail and see which bolts have the raised bolt hole (see red arrows in Figure 9). The bolts that have the raised bolt holes are the bolts you want to remove. Go ahead and remove all the bolts but the last one. You should remove four (4) bolts and loosen the fifth (5) one. You want to use a wrench or deep well socket on the 10 mm bolts. 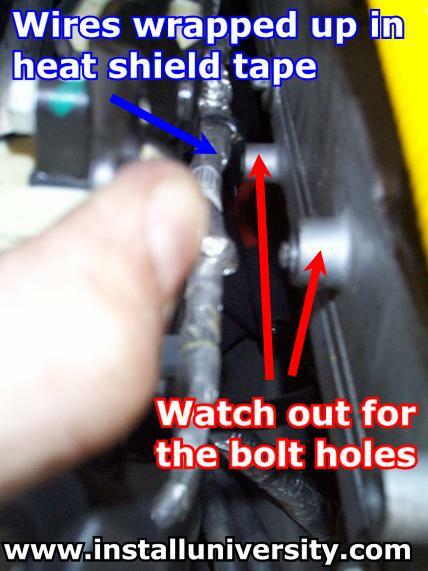 Notice the wires wrapped in heat shield tape behind the coil pack rail (see blue arrow in Figure 9). Be very careful when shifting the coil pack rail upward. The wires might get caught on the bolt holes (see red arrows in Figure 9) and you might pull something loose. Just take your fingers and push the wires toward the coil pack rail a little. This is what the coil pack rail looks like shifted upward (see blue arrow in Figure 10). B. This way you remove the last bolt as well. You can't see it, you have to go by feel and this would take a lot more time to perform. That is why we just recommend loosening it up a little so you can slide the coil pack upward. 13. Go ahead and take off all of your plug wires and lay them off to the side. Get your ratchet, three (3) inch extension, and 15 mm spark plug socket and pull plug number two (2). That is the plug closest to the front of the car on the passenger's side. Work your way back using the same procedure as you did on the driver's side for pulling and installing the spark plugs. The next step will talk about plug number eight (8). 14. You are almost there! A lot of dealerships will not change this plug during a plug install. I guess they figure if they can't do it easily, you probably will never check up on them. By moving/disconnecting the AIR pipe and sliding the coil pack assembly upward, you have made this job so much easier! This plug requires the use of a one (1) inch swivel extension, ratchet and 15 mm spark plug socket. You cannot fit that three (3) inch extension in there so don't even try it. 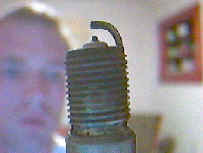 Look at Figure 11 to see our tools on the number eight (8) spark plug. Be careful when pulling this plug. We crawled up onto the engine bay for this plug. We found it easier to break it loose from up top than from the side. We just placed both knees on the battery and faced forward. Our right hand was on the rubber rain guard right below the windshield. Our plug broke loose immediately with no problems. I guess we got lucky on that one. Since you will have the swivel at an angle it will be really easy for you to pop the ratchet apart from the swivel extension causing severe knuckle pain and you to possibly loose a tool. Our three (3) inch extension went shooting through the lower engine compartment. We finally tracked it down to the front steering assembly while changing the number six (6) plug. So take your time and use that muscle wisely. Threading this plug back in can get a little complicated. You basically just have to fiddle around back there until it threads in. This took us about five (5) minutes. 15. Place your spark plug wires on, the number eight (8) plug wire is a little tough to put on, but it shouldn't take more than a few minutes to get. 16. You will need to tighten the bolts on the coil pack assembly to 106 in-lb of torque. Don't forget to tighten the far back bolt that you just loosened up. If you can't fit a torque wrench back in there, just tighten it to hand tight and then just a little bit more. 17. You need to reassemble your AIR pipe now. Torque the two 10 mm bolts, found in Figure 7, to 15 ft-lb not forgetting to place the gasket back in. Reconnect the check valve assembly to the rubber hose and reattach the check valve clamp. Just squeeze it together hand tight. 18. There you have it! 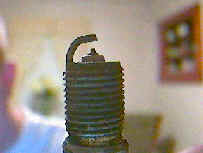 You have just completed your spark plug and spark plug wire change. Easy enough, right? The next time should be even easier, faster, and enjoyable. Go ahead and start your car up and make sure you don't have a plug wire not all the way on. If everything sounds fine and runs fine, this is the perfect excuse to go for a drive (right after you put your tools up of course :-) ). Comments: This install can be very challenging and requires lots of patience. We are confident that you, after reading our instructions, can accomplish this swap in under two (2) hours. We took off a lot of stuff we didn't need to in order to make more room. We will count this plug change as our learning curve and the next one will be much easier! We have a crisper exhaust note after this install. Some popping noise from the exhaust cutout has been eliminated. 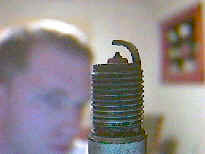 We have included pictures of all our spark plugs after the change. You can look at them below according to their cylinder number. 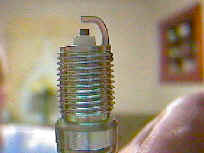 We also added a picture of a new NGK Spark Plug that was used during the install. Trouble Shooting: After this plug install if you hear a loud ticking sound when the engine is under load then you should check your gaskets between the AIR pipe and exhaust manifold. 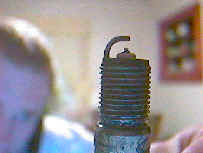 Also, if you hear a ticking sound all the time then you probably have a loose spark plug wire boot on the spark plug.